Though slogans such as 'nursing must be a research-based profession' have been around for a long time, recent initiatives such as Nursing Development Units (NDUs), quality assurance and evidence-based practice have moved nursing to the forefront amongst health professions in taking seriously the promotion of rational care based on a critical appraisal of past practices and the evaluation of new ideas and techniques. This is the first book to examine research and development in clinical nursing practice. It explains how to do it and how to apply it. Brenda Roe PhD, RN, FRSH, Honorary Senior Research Fellow, Institute of Human Ageing, University of Liverpool. Formerly Senior Research Fellow, Health Services Research Unit, University of Oxford. Christine Webb BA, MSc, PhD, RN, RSCN, RNT, Professor of Health Studies, Institute of Health Studies, University of Plymouth. Formerly Professor of Nursing, School of Nursing Studies, University of Manchester. Background, Research and Development in Clinical Nursing practice - an Overview, Brenda Roe. The Art and Science of Research in Clinical nursing, David R. Thompson. Research Methods, Qualitative Research - definitions and Design, Anne Williams. Data Collection in Qualitative Research, Heather Waterman. The Preparation and Analysis of Qualitative Interview Data, Carl May. Meta-analysis and Systematic Reviews of The Literature, Fahera Sindhu. Quantitative Research Designs, Kathryn Getliffe. Methods of Data collection of Quantitative Research, Anne Mulhall. Health Status Measurement and Outcomes, Crispin Jenkinson. Statistical Considerations in Design and analysis, Nicola J. Crichton. Development of Clinical Practice, developing Practice Through Research, Ann Mcmahon. The Dissemination and utilization of Research, Sheila Rodgers. Use of Clinical Guidelines in The development of Practice, Kate Seers. Action Research - The Debate Moves on, christine Webb et al. Evaluation Research for The Development of Health Care and Health Services, Brenda Roe. The Relationship Between Clinical Audit and research, Francine M. Cheater and S. Jose Closs. 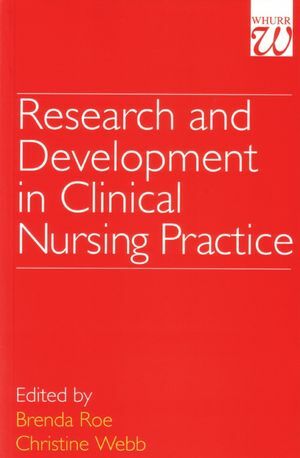 Research and Development in clinical Nursing Practice - The Future, Brenda Roe and Christine Webb.